A consolidated group of militants under the aegis of Joint Niger Delta Liberation Force (JNDLF) on Thursday threatened to launch six missiles in the Niger Delta region, The Nation reports. The group said it would commence the testing of its six missiles which would last for three days on June 7. Though it did not disclose the nature of the missiles, it warned that no airplanes should fly in and out of the country within the period, claiming that the weapons were capable of hitting any object despite its size. It said its fighters trained for that purpose had already arrived the region with its foreign partners through what it described as the country’s porous borders. The group in an electronic statement said it took the decision to further wreck havoc in the region in a meeting attended in Yenagoa, Bayelsa State, by its commanders. 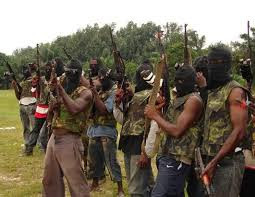 The militant group said Bayelsa State not Delta State is the command base of the Niger Delta Avengers (NDA) and warned the Commissioner of Information and Orientation in Bayelsa, Mr. Jonathan Obuebite to stop criticizing NDA. The group in the statement which repeatedly referred to President Muhammadu Buhari as “Pharoh”, said the highest organ of JNDLF, the Joint Revolutionary Council (JRC) concluded that the launching of the missiles would signal its readiness for the final breakup of the country.